The circumstances and challenges of our time call for wise counsel and disciplined practice. 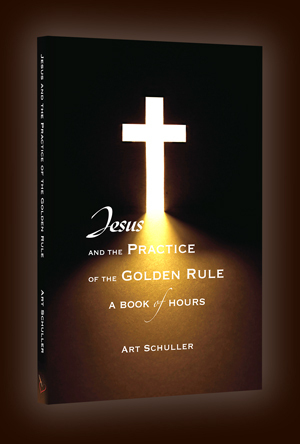 Jesus and the Practice of the Golden Rule - A Book of Hours offers each of us just these gifts. Written to be a useful devotional tool in the real life practice of the Golden Rule, this book is not about doctrine; rather it is about energizing the practice of loving God and your neighbor. It will help feed your soul and expand your service to those around you. in its several iterations became a deeper consideration of the transforming power of empathy and forgiveness that Jesus brought to this principle which lies at the heart of all of the world's religions and great philosophies. The format of the book is taken from books of hours, the devotional resources of the Middle Ages designed to nurture the spiritual lives of lay Christians. It is arranged in seven days, Sunday through Saturday, setting aside four times during each day, Morning, Day, Evening, and Night, for reading, meditation, and prayer. The readings are from the Christian scriptures and the Hebrew psalms, and the prayers are from several religious traditions. Included in the prayers, introits, and benedictions are poetry and comments by the author.